Homemade hair dye is a natural, affordable, fun way to alter or enhance your hair. Dyeing your hair at home is non-toxic and also easy on the environment. It is easy to make homemade dye formulas for blonde, brunette, red, and fantasy shades using ingredients you may already have or can purchase at your local grocery store. Keep in mind, though, that homemade hair formulas may not alter your hair to your desired color. Stronger chemicals may be needed to achieve a desired level of color. A strand test done prior to the procedure will give an accurate color assessment. There are several natural recipes to dye hair brunette, including some organic alternatives. Not that picky? This super-simple recipe for coffee hair dye uses ingredients you may already have in the house; you can also use black tea. Mix apple cider vinegar into brewed coffee or black tea. Comb through hair so all the hair is coated. Put shower cap over hair and leave on hair for approximately for 30 minutes. Wait 24 hours before shampooing hair. This formula provides an easy way to lighten your hair, though be mindful that it is not as powerful as commercially available blonde hair dyes. 12 Aluminum foil square sheets about 5" x 5"
Section hair you'd like to develop with rat tail comb (use end of comb to achieve straight parts) and clip. Mix baking soda and hydrogen peroxide to form paste (it should be spreadable but not drippy). Place foil under hair sections (one at a time) to be colored and brush paste on hair. Seal foils by folding them. Leave on hair for 30 to 60 minutes; processing time depends on the strand test. Rinse after desired color is achieved. There are many shades of red and making your own natural red dye is a great way to add zip without breaking the bank. Some individuals have used a combination of beet and carrot juice or Kool-Aid. Rose hips (available from your local health food store) can also be used. Brew rose hips in water to form a dark tea (brew long enough so it's reduced by half). Comb mixture through hair with wide tooth comb. 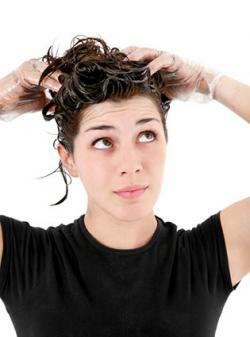 Put shower cap on and allow to sit on hair for about 60 minutes, adjusting as needed based on your strand test. Refrain from shampooing for 24 hours. Fantasy colors are the rage among many teens and some adults. Popular hues like blue, green, and purple are edgy, vibrant, and fun! You can find these hair dyes stocked at many beauty supply stores, but if you're on a budget and enjoy experimenting with color, using food coloring is a great option. Choose the food color you wish to use and mix it with the shampoo in the applicator bottle. (For every ounce of shampoo, add six drops of desired coloring until you have enough. The total amount you need depends on how much hair you wish to cover). Shake the bottle until shampoo and coloring are thoroughly blended. Add 1 tablespoon of water per ounce of shampoo and shake again, for about two minutes. Apply Vaseline around face just under hairline so the food coloring doesn't stain your face. If necessary, clip sections away that you do not wish to color. Starting at your roots, apply the food coloring mixture to desired sections or whole head. Leave on hair 30 minutes to three hours, based on your strand test results. Rinse shampoo mixture out of hair, and condition. Style as usual (refrain from regular shampooing for 24 hours). Although making your own hair dye can be fun and will work well for a temporary or subtle color change, there are downsides. Natural, home-based products may not always color the hair as well as their chemically-based counterparts. Covering grays or changing hair color drastically may be very difficult, or even impossible, to do with only home ingredients. Effectively lightening hair or getting highlights can also be very hard to accomplish without chemical lightening products. Making your homemade hair dye can be an easy, affordable way to change your look without a drastic difference. If you want to change your hair shade slightly or need a fun temporary color fix, making dye at home can be a perfect option for your color.